Customized maritime research and consulting, backed by decades of experience. Locus seeks to advance the maritime industry through rigorous research and consulting initiatives. 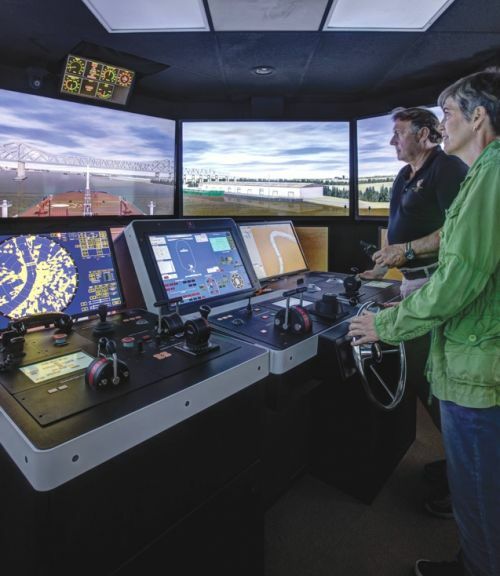 Using a wide array of tools—including manned ship models, customizable waterways, innovative simulation, and virtual scenarios—we seek to create safer and more effective real-world outcomes. Locus is also the managing entity of Maritime Pilots Institute. "Locus has provided excellent service and has been an important part of Venture Global LNG’s Waterway Suitability Assessments. Locus' marine simulation, area modeling, LNG vessel and tractor tug hydrodynamic vessel modeling are realistic and highly-valued by VGLNG and the participating ship pilots. We look forward to continued work and success with Locus." "Locus is a trusted technical company that provides consultation and project management to the Houston Pilots. Recently Locus created for the Houston Pilots a custom aluminum containership manned model and a custom scaled waterway of a section of the Houston Ship Channel. This project and other ongoing work from Locus is greatly assisting the Houston Pilots in supporting the growth of the Houston Ship Channel."